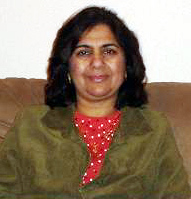 Kalpana (Mujoo) Singh, PhD is a faculty member at the Brown Foundation Institute of Molecular Medicine for the prevention of human diseases and an adjunct faculty member of the Department of Integrative Biology and Pharmacology at the UT Health Science Center at Houston. Kalpana received her undergraduate and Masters degrees from Lucknow University and her doctoral degree in Biochemistry at the Central Drug Research Institute in India. She pursued her postdoctoral training at the Scripps Research Institute in La Jolla, CA, in the area of Biochemistry, Cancer Biology and Tumor Immunology. During her postdoctoral training she developed a number of monoclonal antibodies against well-characterized tumor associated antigens and one such antibody has been used in multi-center clinical trials for human neuroblastoma (child hood brain tumor) and melanoma (skin cancer) in the USA and Germany. During her term at the University of Texas M.D. Anderson Cancer Center, Dr. Mujoo was involved in conducting research in basic cancer biology and experimental therapeutics area. She focused her efforts in elucidating the molecular mechanisms of various anti-cancer agents and studying their therapeutic potential in various cancer models. Her current research focuses on delineating the role of nitric oxide (NO), a colorless, odorless gas and cyclic GMP (second messenger) signaling in proliferation, differentiation, and self-renewal of mouse and human embryonic stem cells and adult stem cells. In addition, she is interested in elucidating the role of NO signaling pathway in various human cancers. Dr. Mujoo is a member of International Society of Stem Cell Research and American Association for Advancement of Sciences. She has also been a past member of the American Association for Cancer Research. Kalpana was born in Srinagar, Kashmir and brought up in Lucknow, where her father was a university Professor. She is married to Dr. Balraj Singh who received his Ph.D. in Life Sciences from JNU, New Delhi. She is a mother of two teenage boys (19 and 14) and is blessed with wonderful family and friends who have touched her life in many ways.